Ronald McDonald House Charities of Alabama (RMHCA)was honored by Wells Fargo with a $1,000 grant through the company’s Days of Giving program throughout the Mid-South this fall. RMHCA was among 34 Birmingham groups chosen by the bank’s team members for the recognition. The ceremony took place Oct. 2 at the Birmingham Zoo. 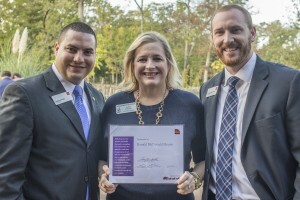 Including this year’s support, Wells Fargo has given $843,000 in Days of Giving grants alone to groups across the Mid-South since the program began in 2010.